Aurora Borealis is a proposed icebreaker, drilling ship and multipurpose research vessel, which will operate both in the polar regions and in the open sea, Image courtesy of AWI/SCHIFFKO PRV 200. Aurora Borealis will be capable of navigating at 3kt while breaking ice of 2.5m thickness. Image courtesy of AWI/SCHIFFKO PRV 200. Bottom view of the Aurora Borealis ice breaker research vessel. Image courtesy of AWI/SCHIFFKO PRV 200. The atrium of Aurora Borealis incorporates a moonpool. Image courtesy of AWI/SCHIFFKO PRV 200. Aurora Borealis is a proposed icebreaker, drilling ship and multipurpose research vessel being developed by Ericon, a consortium of 19 institutions and agencies from 11 European countries with the European Science Foundation as the co-ordinator. The ship will be used to conduct research on the polar region and its impact on the environment. The vessel will be capable of navigating at 3kt while breaking ice of 2.5m thickness, and sail in open water at a maximum speed of 15.5kts. It is designed for a lifespan of 35 to 40 years from the date of commissioning and will operate in extreme temperatures of up to -50°C. The design of the ship was provided by Wartsila Ship Design. "The vessel will be capable of navigating at 3kt while breaking ice of 2.5m thickness, and sail in open water at a maximum speed of 15.5kts." The idea of designing the advanced icebreaker, drilling and multipurpose research vessel was first conceptualised in 2001. The evaluation activities started in 2002 and the technical design of the ship was presented in 2008. The preparatory phase of the project was funded by the European Commission (EC) through a €4.5m grant, as part of the seventh project in the European Strategy Forum on Research Infrastructures (ESFRI), from 2008 to 2012. The technical feasibility and design study for the vessel was completed in 2009. It was initially carried out by the University of Applied Sciences Bremen and Hamburg Ship Model Basin (HSVA) and then handed over to the German Council of Science and Humanities (Wissenschaftsrat) and further to the Alfred Wegener Institute for Polar and marine Research (AWI) before finally being handed over to Ericon. The technical feasibility and design study was carried out with an investment of €5.2m ($6.9m) funded by the German government. The project awaits financial backing from concerned governments for construction to commence. The initial estimated cost of construction of the vessel was €800m ($1.07bn). The high estimated cost had led the EC to drop the project from the ESFRI list in 2010. 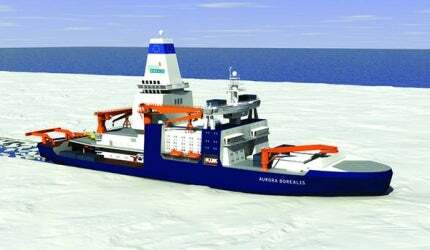 The consortium then assigned Aker Arctic for a more cost-effective vessel. The presentation of the revised design was made in March 2012 and the anticipated cost for the construction of the ship known as Aurora Slim is estimated at about €500m ($669m). The Aurora Borealis is designed with an overall length of 199.85m, a length of 174.27m between perpendiculars, a moulded breadth of 49m, a breadth of 45m at 13m draught and displacement of about 65,000t. The design details of Aurora Slim are yet to be announced officially. Aurora Borealis will be equipped with an aft moon pool and a fore moon pool. The former will facilitate drilling while the latter will enable equipment to be deployed close to laboratories. The marine researchers will be capable of operating remotely operated vehicles (ROV) and autonomous underwater vehicles (AUV) through the moon pools, enabling the scientists to study and conduct multidisciplinary marine research. "The ship will be used to conduct research on the polar region and its impact on the environment." A drilling rig using the riserless drilling technique will be capable of drilling at water depths of 100m to 5,000m and 1,000m below the mudline. The rig will measure 85m in height above keel and have a loading capacity of 680t. The proposed vessel is designed for up to 90 days stay in very harsh conditions both in polar regions and open seas. The vessel will also be equipped with scientific echo sounding systems. The vessel will be capable of breaking ice laterally in both forward and backward positions. The lateral icebreaking capability is enabled by the design of the hull, which will consist of a heeling tank system and sloped side walls to enable the ship to break ice during dynamic positioning. The ice that goes beneath the ship during icebreaking can also be tackled by the strengthened propeller. The vessel will accommodate 120 members in 80 single and 20 double cabins. It will be equipped with a helicopter hangar and landing deck with a capacity of three helicopters. NB-506 Vitus Bering is the first vessel in a series of two multifunctional offshore icebreaking supply vessels (MIBSV) ordered by SCF Sovcomflot. The vessel will be fitted with eight generators with a maximum output capacity of 94MW, in addition to emergency generators, waste heat recovery and exhaust gas cleaning systems. It will have diesel-electric main propulsion with three 27MW shafts measuring 6.5m in diameter each. Two transverse thrusters comprising of three units will also be incorporated into the ship. The transverse thrusters will be fixed and fully retractable with one unit placed forward and the other on the aft. They will also be usable in a retracted position for manoeuvring.